I'd like to note that Java 6 is no longer supported by Oracle (http://www.oracle.co...eol-135779.html). If security issues are found, they will not be fixed. I'd like to note that the Java 6 requirement is only short term (as in for the next few days...). We're well aware that it's at the end of it's life cycle. Once the RuneScape HTML5 client comes out, if a player plans to stick with Java (including v7) they can continue using the default browser in SwiftKit which will work just fine with the latest Java. At the moment though there is no problem using Java 6. Hey Stidor (and possibly, other Devs). I'm Currently Using The Canary build for Google Chrome Thus your client does not recognise it as compatible, would this be a simple job of just changing the way your client detects chrome to allow Canary/Beta builds of chrome or will you stick to only allowing the stable build? We did notice some discrepancies in chrome build locations during testing, but it was very isolated cases and hard to pinpoint the origin of this. If you could tell us the path for your chrome executable we will certainly look into it, but I make no promise as we are fans of using stable and tested solutions to ensure a good experience. Is it different with Canary? Doesn't matter. I've added a setting into View > Settings that allows you to manually set the path to Chrome. Just tested with Canary - should be working fine if you manually set the path. The latest SwiftKit update removes the Java 1.6 requirement! You should now be able to use the Chrome Frame with the latest version of Java installed. I don't have the chrome option? i downloaded the latest version today, but still don't have the option. What do i have to do to get this option? Chrome removed support for Java (hence RS) some time ago due to security issues - I would assume this is why there is no option there, as it is impossible to run in Chrome. Arceus is correct. Chrome dropped support for Java plugin so there is no way to run RS in Chrome anymore. Thus the support for Chrome frame was dropped. Which means i can't run NXT on swiftkit? If i do i get a seperated window. A swiftkit window and a client window. We're working on integrating the new NXT client with SwiftKit. Why do I not have the Chrome Frame option for swiftkit when I use the drop box from the play runescape button? I have Google chrome and it's even set as default browser. 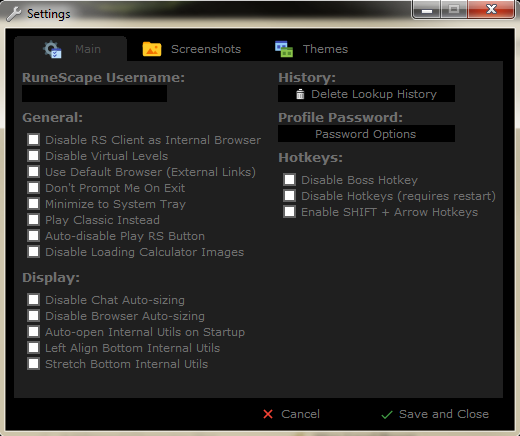 The only option I have to check is "use RS Client" which doesn't even work. So when I hit play (oldschool) it plays from the downloaded Rs Client which is a separate page... What am I doing wrong? You are doing nothing wrong. Like said above, Chrome has dropped support for the java plugin so we can't use chrome anymore. I see.... Well that's a total bummer. Hoping for a resolve soon.